Pizza For Breakfast Is Always Great, But THIS Version Is Amazing! Who doesn’t like pizza for breakfast? It’s definitely a favorite in our home, and leftover slices are a hot commodity. But THIS pizza is just about the best way to start your day! 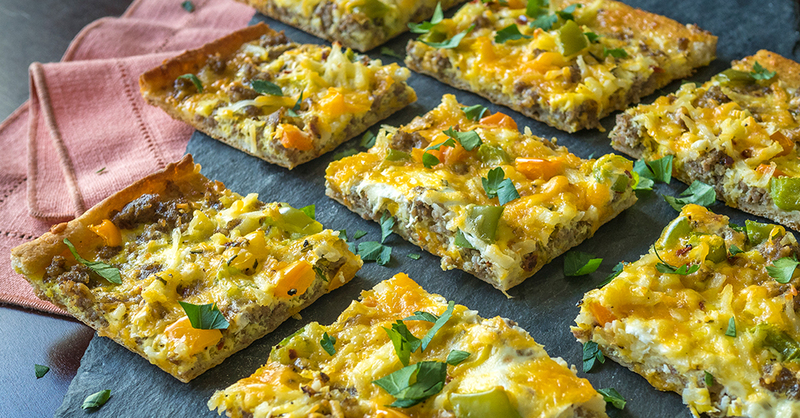 Baked on a flaky crust, we top ours with eggs, cheese, and breakfast sausage, but really the topping possibilities are endless. We like to take it up a notch by mixing our favorite hot sauce with sour cream to create and elegant and flavorful drizzle. It’s perfect for weekend brunches (and always a huge hit), but it also keeps well, so often we’ll whip up a batch and have it for a quick and filling breakfast all week long! Preheat oven to 375ºF and spray a 10x15-inch sheet pan with nonstick spray. Spread the rolls evenly over sheet pan, pinching the seams together to create one flat crust. Evenly spread the sausage over dough, followed by hash browns, then cheese. In a medium bowl, whisk eggs, milk, garlic, rosemary, pepper flakes, salt, and pepper together, then pour evenly over pizza. Gently place tomato and bell pepper slices on top of egg mixture, and bake for 25-30 minutes, or until the eggs and dough are cooked through. Garnish with parsley or green onions. Serve warm, and enjoy! She Puts Chicken In A Bowl And Turns The Hand Mixer On… Genius! Jennifer Garner’s New “Pretend Cooking Show” Is A Must-Watch.